Save 10% on Contiki's favorite animal experiences vacations. Plus receive our AffordableTours.com 5% extra savings. Valid on new bookings only. Book a select trip traveling between 01APR2019 & 31DEC2019 & pay a $200 deposit by 30APR2019 to save. Applicable vacations are; THAI ISLAND HOPPER WEST, NORTHERN THAI HIGHLIGHTS, JAPAN UNRIVALED, ECUADOR & GALAPAGOS, BEACHES & REEFS, VIVA COSTA RICA, THE KIWI BUCKET LIST, GORILLA TREK, CAPE SAFARI & FALLS, EAST AFRICA SAFARI. Offer is not combinable with other current land promotions or last minute deals but is combinable with ongoing brochure deals, past passenger discount, one special deal per pax, and current air promotions. Discount applies to land only and excludes taxes, government fees, and internal flights. Promotion is valid per passenger. Promotion does not apply to food fund, internal flights, taxes and government fees. Additional restrictions may apply. Konnichiwa! And welcome to our ultimate trip to Japan. Experience traditional Japanese hot springs in Tokyo, explore Kyoto the cultural hub of Japan by visiting the Fushimi Inari Shrine & travel around Tokyo taking in all the bright lights and quirks as well as eating as much sushi as possible. This is the only way to be guided around Japan, one of the most unique countries in the world. Here amongst the bright lights and quirks of Tokyo we'll get acquainted with our new squad for what might just be the best 13 days of our lives. After checking-in to our hotel and maybe doing some DIY exploring, we will join up and get the excitement pumping - who's ready to start unraveling the incredibly unique country of Japan? Today we'll bounce out of bed ready and raring to uncover Tokyo. The ancient Buddhist temple of Asakusa Senso-ji, the lake woven grounds of the Imperial Palace & the Meiji Jingu shrine are just some of the doors we will open to this city. If history and religion don't get you going, the wild fashion of Harajuku & the shopping district of Nakamise Street might see you more wide-eyed. Or perhaps your idea of fun is to take to the streets of Shibuya, attempting to cross the busiest pedestrian crossing in the world. Tonight, we've got a Free Time Add-On we reckon you'll find hard to resist - a much needed soak in traditional Japanese hot spring baths, locally known as an Onsen. Be warned though, these hot springs are not for the shy (meaning total nakedness), but are the perfect way to unwind after a day of exploring the sights & sounds of the city. Today is yours to take on Tokyo your way. This is your chance to dress up as your favourite superhero and experience Tokyo on a Maricar go-cart, zooming through some of Tokyo's most famous areas like Akihabara, Tokyo Station, Ueno, Asakusa & the Tokyo Sky Tree. Or perhaps you're more about doing a sushi crawl, eating until your waist is the shape of Futomaki (that's the large roll). Love records? Head to the narrow city buildings to discover some eclectic finds. Want to make this night in Tokyo your weirdest, wackiest and most space age yet? We have two words for you my friends: Robot Restaurant. A bonkers multi-million dollar production that's set to blow your mind. Tonight, we top it off with a quintessential Japanese quirk: the Robot Restaurant Experience. A bonkers multi-million dollar production that's set to blow your mind. Tonight, we top it off with a quintessential Japanese quirk: the Robot Restaurant Experience. A bonkers multi-million dollar production that's set to blow your mind. Tonight, we top it off with a quintessential Japanese quirk: the Robot Restaurant Experience. A bonkers multi-million dollar production that's set to blow your mind. Tonight, we top it off with a quintessential Japanese quirk: the Robot Restaurant Experience. A bonkers multi-million dollar production that's set to blow your mind. Tonight, we top it off with a quintessential Japanese quirk: the Robot Restaurant Experience. A bonkers multi-million dollar production that's set to blow your mind. Tonight, we top it off with a quintessential Japanese quirk: the Robot Restaurant Experience. A bonkers multi-million dollar production that's set to blow your mind. Tonight, we top it off with a quintessential Japanese quirk: the Robot Restaurant Experience. A bonkers multi-million dollar production that's set to blow your mind. Tonight, we top it off with a quintessential Japanese quirk: the Robot Restaurant Experience. A bonkers multi-million dollar production that's set to blow your mind. Tonight, we top it off with a quintessential Japanese quirk: the Robot Restaurant Experience. A bonkers multi-million dollar production that's set to blow your mind. Tonight, we top it off with a quintessential Japanese quirk: the Robot Restaurant Experience. A bonkers multi-million dollar production that's set to blow your mind. Tonight, we top it off with a quintessential Japanese quirk: the Robot Restaurant Experience. A bonkers multi-million dollar production that's set to blow your mind. Tonight, we top it off with a quintessential Japanese quirk: the Robot Restaurant Experience. A bonkers multi-million dollar production that's set to blow your mind. Tonight, we top it off with a quintessential Japanese quirk: the Robot Restaurant Experience. A bonkers multi-million dollar production that's set to blow your mind. Tonight, we top it off with a quintessential Japanese quirk: the Robot Restaurant Experience. A bonkers multi-million dollar production that's set to blow your mind. Before we leg it out of Japan's capital we have some very serious business to tend to - a guided tour of famous Tsukiji - the world's largest and busiest fish market. Here, why not opt to learn the art of sushi making, or just kick back in one of the markets sushi bars and soak in the atmosphere.Our first overland journey takes us south to Hakone, completely removing us from Tokyo's fast city pace. We will take in Japanese mountain vistas from the Hakone Ropeway & spend the night in a traditional guesthouse where we'll be treated to some local Japanese hospitality. Waving our supremely hospitable hosts goodbye we hit the road in search of a long valley amidst the Japanese mountains.After a full day of exploring and ogling and Japanese countryside, it would be perfectly acceptable to crash out on arrival in Takayama. Particularly acceptable given we have all day tomorrow here to explore. Dark wooden buildings, Kanji signs & surrounding hillsides will see us totally taken by Takayama. Grab a bike and take a cycle, then unwind from it all with a Japanese footbath in our hotel's very own hot springs overlooking the mountains. There's not many places where relaxation feels quite like this. Tonight is yours to explore as you wish, but we have an inkling you won't want to miss the mouthwatering hida beef for dinner. In usual circumstances we'd be quite sad to be leaving the soul-stirring town of Takayama, but with the bullet train experience whipping us to Hiroshima it's hard not to get excited.We did it! We travelled on land at a casual 320 kilometers per hour on the Shinkansen - the world's fastest train. That's a big old tick off the Japan bucket list. Hiroshima is yours this afternoon to explore your way. A city mourned over as the world's first atomic bomb target during World War ll, the mood will turn reflective as we enter Hiroshima. Thankfully, today this historical great has been declared a City of Peace, symbolised by coloured paper cranes denoting people’s prayers. Our day here will be one of learning as we take in the tragic recounts of World War II at the Peace Memorial Museum. 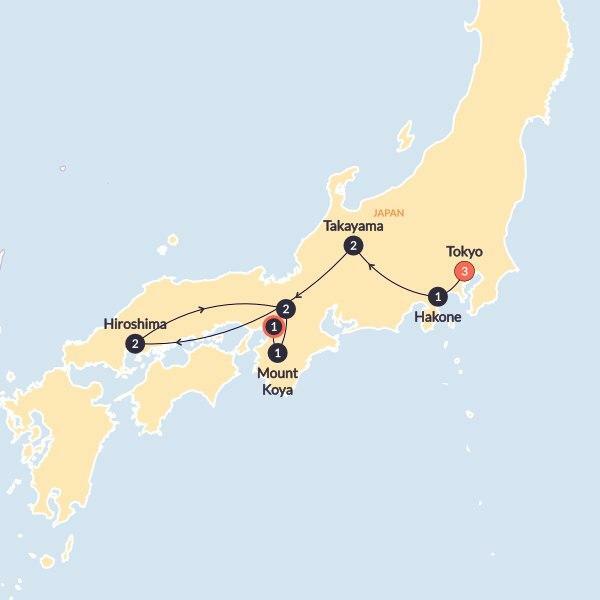 With 3 more destinations left to uncover on the Japanese map, we hit the road this morning and leave the historical metropolis of Hiroshima behind.Welcome to the culture hub of Japan. Geisha girls, artfully manicured gardens, shrines & temples aplenty - looks like we're in Kyoto! We won't waste a minute peeling back this city's layers, taking you to Kinkaku-ji Golden Pavilion, Nijo Castle & the Gion Area with our guide. You'll also have plenty of free time to check the place out any old way you please, and go on the lookout for glamorous geishas. If that means wearing a kimono and platforms, we're right here to applaud you. So what's up next? How about checking out the Fushimi Inari Shrine? Approx 233 metres above sea level, the journey to the shrine begins at the base of the mountain. This afternoon is free for you to explore the sights of Kyoto. Enjoy a slow and leisurely morning in Kyoto to get in the zen frame of mind for what lies ahead. On the train we make tracks for Mt Koya. You would think that by this stage of the trip all the phenomenal moments might be behind us. Oh how wrong you would be. Tonight we stay in a Buddhist guesthouse, eating traditional food and savouring the mindfulness & beauty of this incredible experience. For those looking for a digital detox amongst nature, it doesn't get better than this. It's our last full day of the trip - make the most of it by rising early this morning and partaking in the tradition of an early morning Buddhist service. A Local Guide will then walk us through the beauty of the Koyasan area and centuries old cemetery before we move on to our last destination. For those who have stepped out of their quiet zone from the morning of serenity, it will be time to relish in Osaka and take on the traditional Japanese pastime of Karaoke. A couple of Asahis or Sakes - you know, for tradition - should stimulate your bravery. Today our Japanese fairytale comes to an end. Whilst we'll be crying silent (or not so silent) tears, our life-lasting memories, army of new friends and deep appreciation for Japan will be enough to keep the smiles on our faces. Sayōnara, globe trotters! See the Meiji Jingu Shrine, Harajuku & Shibuya Crossing. See Kamisan no machi (Kamisan Town), Takayama morning markets & Jinya house. 3-star hotels are the name of the game, plus you'll get the chance to shack-up in a traditional Ryokan, as well as a Shukubo up on Mount Koya. We like to keep it intrepid, but there's no compromise on comfort. Re-fuel with a hearty breakfast included every day, plus a few delicious dinners. We'll also give you the opportunity to sample some of the best eats in the East. We'll get 14 of your meals, you get the rest. Taste it all - fresh sashimi, spicy ramen and delicious gourmet gyozas.